Eczema is a term for dermatitis, or inflammation of the skin. It can have many causes, can be acute or chronic, and tends to produce dryness, scaling, and itching of the skin. Atopic Dermatitis is the most common type of eczema, with 10 to 20% of children and 1 to 3% of adults affected by this condition. For most people with atopic dermatitis, it begins during the first year of life. While any eczema may be caused by irritants and severely dry skin, it can also be caused by allergens. After an evaluation with a dermatologist, it may be recommended to have allergy testing done. Sometimes, an inhaled or ingested allergen is suspected and the dermatologist may advise testing done by an allergist (to detect food and environmental allergies, for example). In other instances, an allergen which has come into contact with the skin is suspected (such as nickel or fragrances), and the dermatologist may advise a “patch test.” A panel of the most common skin allergens is applied to the upper back and then the patient returns to the office two to three days later to have the test read. If the dermatologist identifies a positive allergen, simple avoidance of the substance may allow the eczema to completely resolve. It is important to be evaluated by a dermatologist as eczema is a condition that can show up on not only the skin, but also in the hair and nails. In addition, there are other skin conditions that can resemble eczema and atopic dermatitis that are linked to internal medical conditions, infections, nutritional deficiencies or even internal cancers. If these are not identified, there can be much more serious consequences than just those seen on the surface of the skin. There is usually not one single treatment, but a combination of treatments and lifestyle changes which produces the best, most long-lasting results. Treatments may include both steroid and non-steroid creams used to reduce the inflammation and itch. Use of humidifiers and daily moisturizers can help repair the skin by increasing its hydration and helping it withstand potential irritants and allergens. In more severe or resistant cases, an oral antihistamine and/or oral steroid medication may be prescribed. Another option to calm inflammation and itch is controlled ultraviolet (UV) therapy, performed in the office and available at Brinton Lake Dermatology. After an evaluation, a dermatologist can discuss all the treatment options available and customize a treatment plan which is right for you. 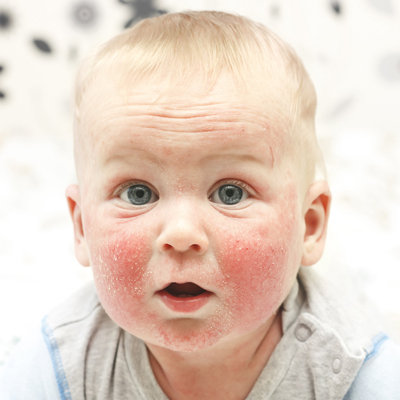 When atopic dermatitis begins during infancy, it is called infantile eczema. Itchy patches tend to develop on the scalp, forehead and face, especially the cheeks. During the childhood phase, itchy patches usually form on the back of the knees, the inside of the elbows, and sometimes the neck and face. Usually, as the child gets older, the eczema tends to gradually get better. Those who have atopic dermatitis are more likely to develop asthma and hay fever. Treatments for all three conditions may be necessary. During the teenage and young adult years, the itchy patches often develop on the elbows and knees. Other common sites for these patches are the hands, feet, ankles, wrists, face, neck and upper chest. Approximately half of those who have a history of atopic dermatitis are at risk of developing hand eczema. There are many causes of hand eczema. Overexposure to irritant chemical trauma, such as soap and water, or other solvents, and physical trauma, such as digging in the garden without gloves or handling large quantities of paper, can cause hand eczema or make it worse. Without proper diagnosis and treatment, hand eczema can become chronic and interfere with everyday activities and on-the-job tasks. It may take months for the patches of red, scaly and inflamed skin to heal. Protect hands against harsh soaps, cleansers, and other chemicals by wearing gloves. Use lukewarm water and mild soap when washing the hands and always apply a moisturizing ointment or cream immediately after washing. Reapply the moisturizer frequently throughout the day.